A mathsnack is a haiku-size package of beautiful mathematics, with accompanying illustration. 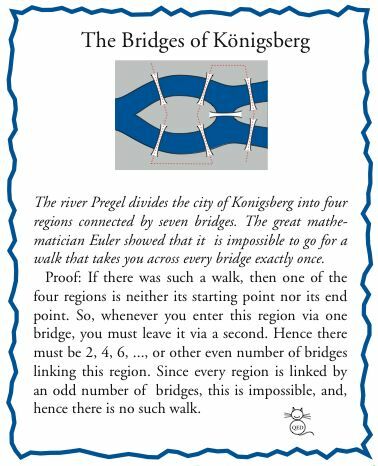 Below is an example, featuring an all time-classic, the Bridges of Königsberg. From 2004 to 2009, each back page of Vinculum (the teachers' journal published by the Mathematical Association of Victoria) consisted of Mathsnacks on a given theme. You can now download six years of Mathsnacks in pdf format, very suitable for printing and postering! Individual snacks are available at the links below, or you can download them altogether as one zipfile here (5 MB).